One of the most essential pieces of equipment you need for Crossfit is a gym bag to hold everything. Sure, you can get away with using an old backpack – but it really helps to have a proper duffel bag with compartments for your stinky shoes, wet towel, and Crossfit gear. There are now tons of Crossfit gym bags available. Before you get sucked in by all of the different styles and colors, take some time to learn what is really important when choosing a gym bag. 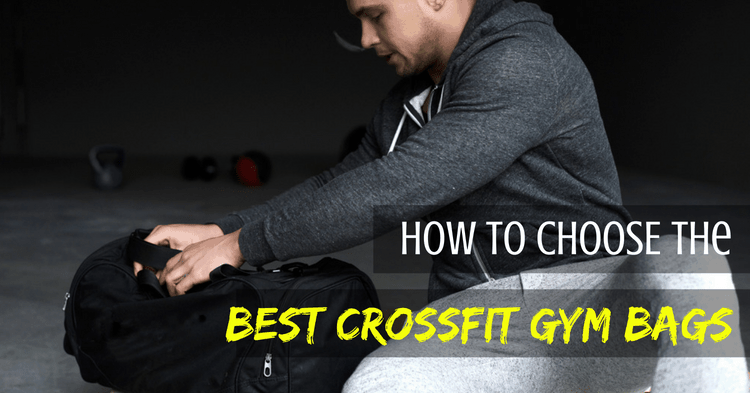 Then check out my top picks for best Crossfit gym bags. Can It Hold All Your Gear? Will It Fit in Your Gym Locker? Once you have your gear list, you can get a much better idea of how big a gym bag you need. Bear in mind that you might be adding more gear as you progress in your training. Rigid or floppy design? Some bags have support panels to help the bag keep its shape. These are great for keeping gear balanced in the bag, but make it harder to get into small lockers. Shape of the gym bag: Recently, there’s been a trend in taller, U-shaped gym bags. These are easier to open and look more stylish, but the shape might not fit in a locker. The best Crossfit gym bags will mention the type of fabric used and their denier. The higher the denier, the thicker and sturdier the material is. Having a sturdy gym bag is great, but it adds a lot of bulk to the bag. A high denier will also make it harder to compress the bag, such as when you’ve got to shove it into a locker. Canvas: Canvas gym bags tend to look very stylish, are durable and are more multi-purpose. However, the canvas isn’t water resistant, absorbs odors quickly, and a bit bulky. The good thing is that you can usually wash canvas duffels in the washing machine. Nylon: Nylon is commonly used for gym bags. It is affordable, water-resistant, durable-yet-lightweight, and doesn’t absorb odors. Polyester: Compared to nylon, polyester is also water-resistant, lightweight, and durable. Polyester tends to be a bit thicker but not as strong as nylon. It holds up better against abrasion and dries faster. Shoe compartment: These can be an elastic pocket inside your gym bag or a zippered side pocket. The zippered shoe compartments are great but do note that they take up a lot of the bag’s interior space. Breathable mesh pockets: These are great for holding wet clothes. Water bottle pocket: I personally prefer external mesh water bottle pockets for easy access. Many gym bags put the water bottle pocket inside the bag though. 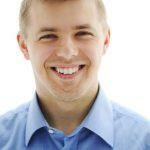 External pockets: Put items you need to access easily in external pockets. Pay attention to whether the pockets are zippered or not! You don’t want your keys falling out. Internal pockets: These make it easy to organize your gym gear. Padded media compartments: Some bags have these for holding phones or tablets. Consider where you will be carrying your gym bag before you choose a color and style. If you bring your gym bag to the office: You probably don’t want a bright orange bag with a giant Adidas logo on it! Look for subtle colors, smaller sizes, and sleek U-shaped designs. If you walk home after the gym: I live close to my gym, so I often wear my workout clothes home and shower there. In these times, I prefer having a duffel which is obviously a gym bag so people know I’m coming from the gym (as opposed to thinking that I’m just a sweaty pig!). One small-but-important thing to look for in gym bags is the strap. If you have any weight in your bag, then you’ll need a sturdier, thicker strap. Padded straps are great so the strap doesn’t dig into your shoulders. Also look at how the strap is connected to the bag. Many cheap Crossfit gym bags use plastic connectors. These easily break or snap off when there is weight in the bag. Metal hooks are much better. If you can only find a bag with plastic hooks, consider reinforcing them with carabiners. 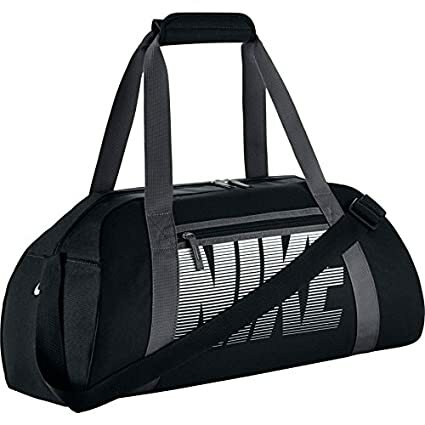 At 12 x 22 x 9 inches, the Nike Club Women’s gym bag is a good size for most Crossfit needs. It is considered a “women’s” bag because of the curved shape and handles. However, the black bag looks “manly” enough to be used by anyone. There aren’t any internal pockets on this gym bag but there is a zippered side pocket for small gear. What this gym bag lacks in compartments though it makes up for with its awesome style. Best For: Women who want a stylish, small duffel bag. 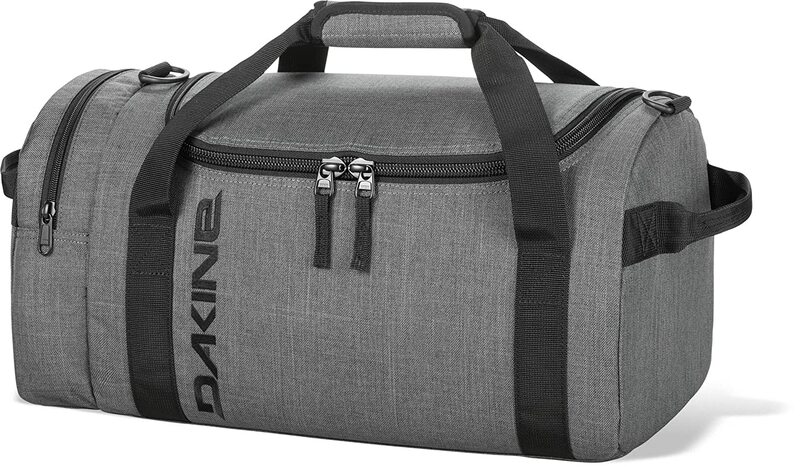 The Dakine EQ duffel was designed so it could double as a gym bag or luggage. There are lots of different styles available. It even packs up flat into its own side compartment. I love that the duffel bag comes in four different sizes (23, 31, 51, and 74 liters). It is definitely able to hold lots of gear. The sturdy, padded straps keep it from digging into your shoulder. I just wish this bag had internal compartments. Best For: People who want a large Crossfit bag that can double as stylish luggage. 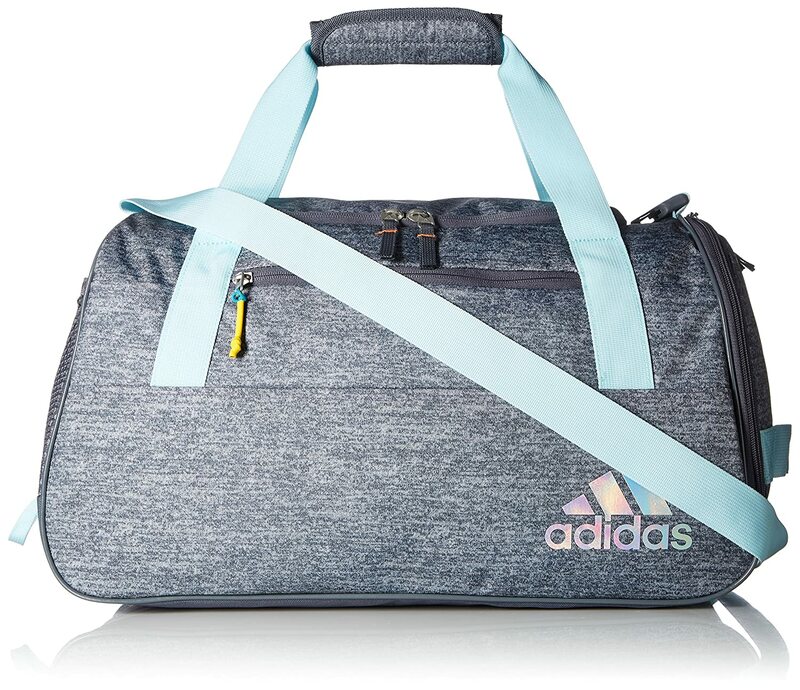 I absolutely love the style of the Adidas Squad III duffel bag. It is all about the details – like how contrasting colors are used for the zippers on some bags. In addition, to be being stylish, the Squad III bag is functional. It has an interior compartment that can fit your shoes, exterior water bottle pocket, and zippered exterior pockets. At 21 x 11 x 12 inches, the bag is fairly small but will still hold all your Crossfit gear. 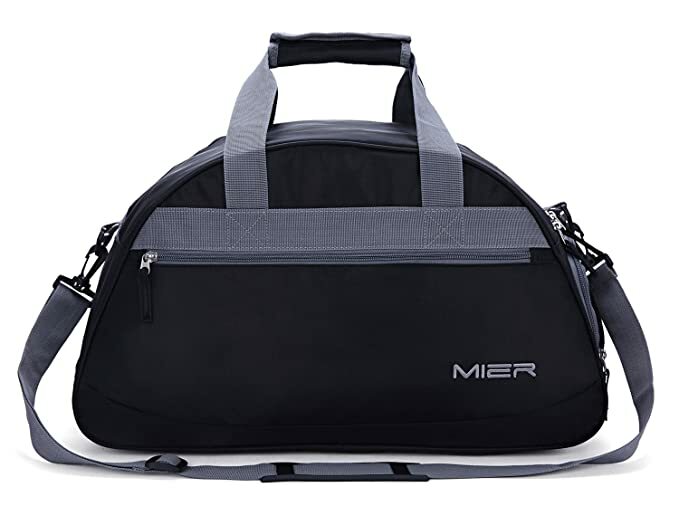 Best For: Women who want a compact, stylish-looking gym bag with compartments. 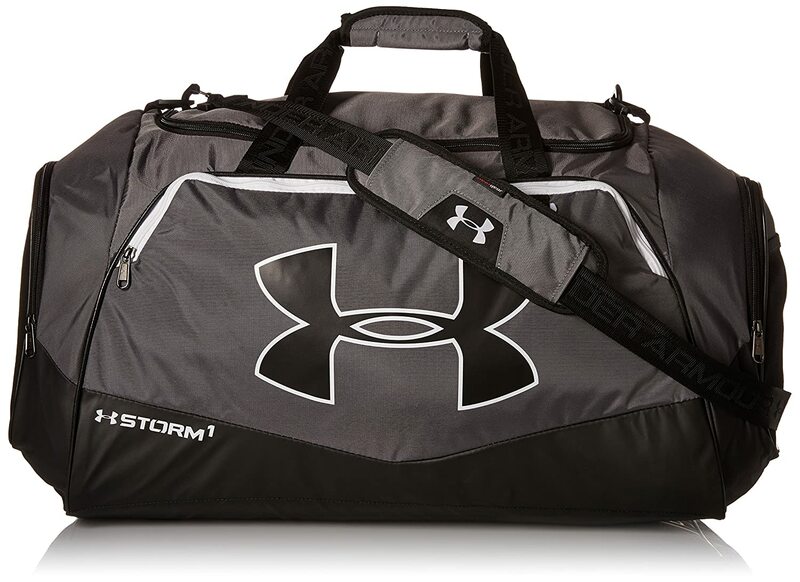 Unlike many other Crossfit bags which focus on style, the Storm Undeniable II duffel bag was made to hold gym gear. It looks like a gym bag and has tons of interior and exterior pockets for all your gear. The gym bag comes in two sizes (though large is often unavailable). The medium size is 13 x 25 x 11 inches with a cubic volume of 3700 cubic inches. Compared to other polyester Crossfit bags, the material seems to be fairly thick and tough. Best For: People who need a large, tough gym bag with lots of compartments. 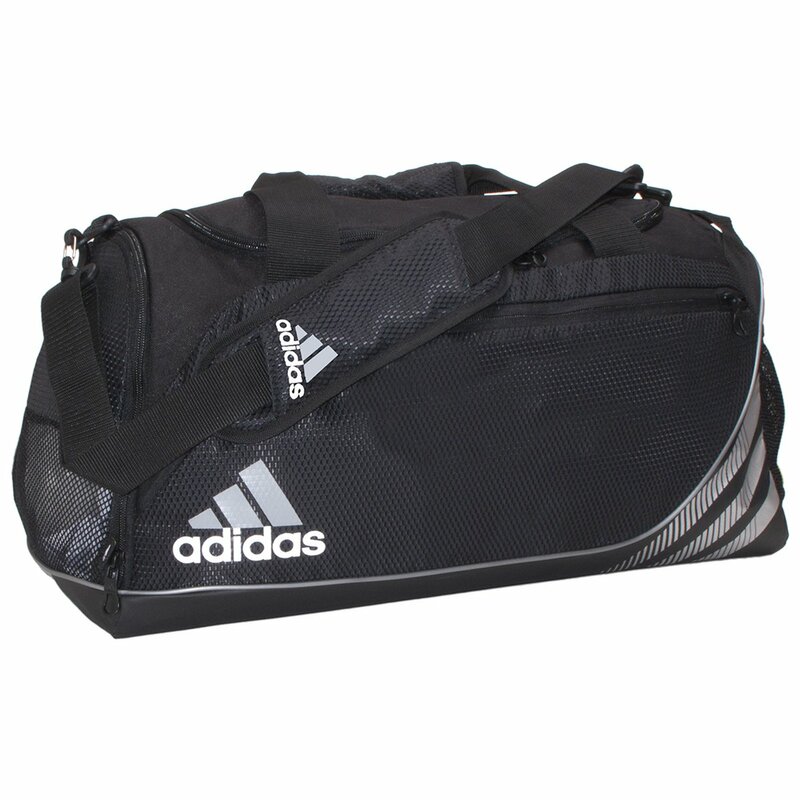 The Adidas Team Issue duffel bag comes in three different sizes: Small is 2800 cubic inches (24 x 11.5 x 12 inches), Medium is 3540 cubic inches (24 x 12.5 x 13.5 inches), and Large is 5370 cubic inches (32.5 x 13.5 x 15 inches). The bags have external zippered pockets, included a ventilated pocket for your shoes. There are also internal pockets, making it easy to organize your gear in the bag. Just note that the small size bag has one fewer external pocket. As you’d expect from Adidas, the bag is well-made. The 600d polyester holds up against tearing. The bag even has a lifetime warranty! Best For: People who want lots of pockets in their Crossfit bag. Here is a Crossfit bag that you could discretely carry to the office or use as carryon luggage. The U-shape of the bag gives it a sleek look and it holds its shape well. Even though it doesn’t look like a gym bag, it still has the functionality of one. The zippered shoe compartment is a great touch, even if it does take up a lot of interior space. The 210d nylon is decent and holds up well for such a cheap gym bag. Best For: People who want a small, stylish gym bag and like having a separate shoe compartment. 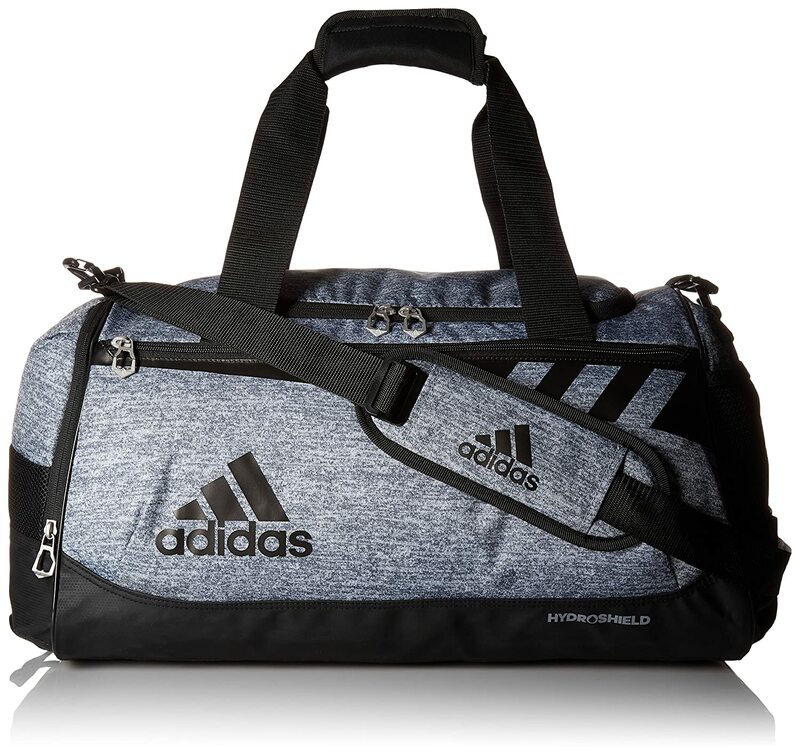 Here is another great Crossfit gym bag from Adidas. At 12 x 13 x 25 inches, it is a lot larger than most “medium” sized gym bags. So be warned that it might not fit in your gym locker well. There is only one interior pocket in the bag, but there are three exterior pockets for small items. The material and construction of the bag are sturdy, hence the lifetime warranty on the bag. The shoulder strap could be better though and, considering the bag’s size, have padding. Best For: People who like lots of external pockets on a large gym bag. It’s hard to choose a single “best” Crossfit gym bag because each person’s needs are so different. If I had to choose just one bag though, it would be the Adidas Squad III duffel bag. It’s the perfect combination of style and functionality all at a great price.